This is Jonathan & Linda. We have been receiving many emails from people regarding Mindy & we appreciate them all. But we wanted to write you a personal "Thank You". 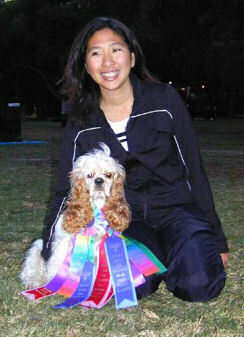 Mindy started her training with you before we moved to Temecula. You set the foundation for Mindy's success. Mindy had many accomplishments in her long career but it was when she was training with you she had one of her most memorable successes to us: 12Q's & 12 1st places in a single trial out of 12 runs! We will never forget that. She went up there & smoked everyone :). 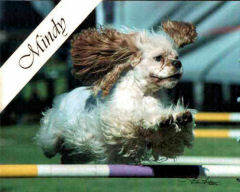 Mindy was one of those "rare" breeds to be successful in agility. Then & even now as I am sure you know the complaint is always, "those darn shelties" or "darn papillons" etc etc. Then next think you know the student is getting one & abandoning their "beloved" breed. Linda never did that. She & Mindy battled those "darn" shelties, papillons, corgies, cattle dogs etc etc for years & consistently placed with them & even beat them. They were a force not to be discounted. 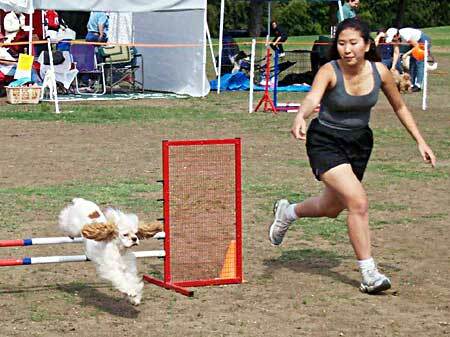 As a team they proved that you can be successful with ANY breed in agility & they also proved just because you don't have a sheltie or a corgi doesn't mean you can't be competitive or even win. Could you do one thing for us in memory of Mindy? 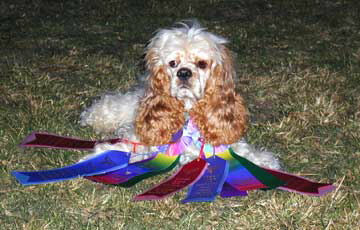 As a trainer, whenever you hear a student with an "unusual breed for agility" complain about those more common breeds or whenever you have a student that wants to quit because they just can't be competitive against those common breeds, or come back depressed from a show upset with their results & "blaming the dog or breed" please do this: Ask them, "have you ever heard of Mindy?" And remind them she was an uncommon dog that proved you can be successful in agility with any breed & she proved that you don't have to "sell out" to be successful in agility. Tell them about her 12Q/12 1st places, that she had a MACH4/ADCH/NATCH, qualified every year she was active for the USDAA world championships in GP & steeplechase etc & always ran clean in the semi final round & even made the finals one year, and placed higher than any other cocker both years at the AKC Nationals in Florida & one year barely missed the finals cut by one place. We could say more, but that should be enough to inspire them we hope. Take care Bruce & Sandy. Thank You for your help in making Mindy what she became.